Marseille Inc., a global leader in quality, innovative HDMI cable products will be showcasing its latest mCable Gaming Edition and mCable Cinema Edition at the E3 Expo June 12-14 as the gaming industry and community descend upon Los Angeles Convention Center to see the latest advances in the gaming industry. Today’s 4K and True HD TVs are designed to produce an incredible image. But the image quality will only be as good as the content quality. Streaming, on-demand, DVD and BluRay disc movies have a lower resolution content than a 4K or True HD TV. mCable upscales 480p and 720p content to 1080p. And it upscales 1080p to near-native 4K so users can see their current content library in a whole new way. Both mCable Gaming Edition and mCable Cinema Edition by Marseille have patented technology that boosts picture quality at 120 FPS with near-zero latency. It even upscales games and movies to 4K or Super HD in real time due to advanced algorithms specifically designed for each experience. mCable contains a powerful video processor from Marseille Inc. where each pixel is analyzed in its immediate and global contexts to determine the most suitable processing per pixel, a Marseille Inc. technology called Contextual Processing. This sophisticated technology enhances regions in an image according to their specific characteristics so as to preserve the image’s balance and give the TV a better image to build upon therefore up-converting images up to 4k Ultra HD to provide your TV with a better image. Technicolor has certified the technology used in mCable to meet the rigorous standards of Technicolor’s 4K Image Certified test suite. 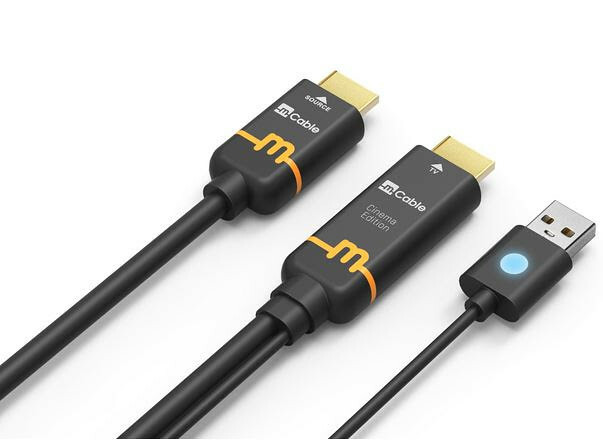 mCable also supports HDMI High Definition Audio for a full range of high definition audio types including DSD, DTS-HD Master Audio, and Dolby TrueHD. mCable refines images on their way to your TV to bring you sharper pictures, better contrast, natural colors and crisp edges for the best visual experience. mCable works with 2D and 3D content with HD TVs and 4K Ultra HD TVs. Aluminum connector shells bring together elegance, superior durability and along with the cable’s triple shielding, provide a high immunity to interference.